Everyone should look after their mental health wellbeing whether you have a diagnosed mental health illness or not. It is important for us to take time for ourselves to ensure our mental health and wellbeing is not forgotten, to keep our mood lifted and to not let things build up too much. 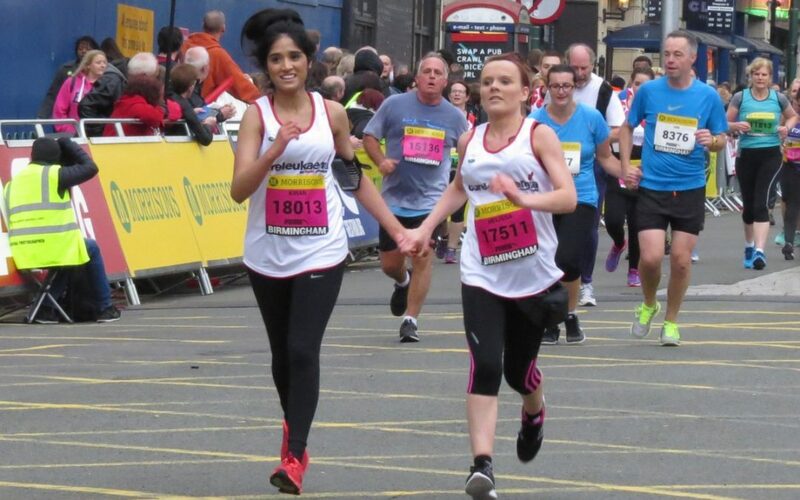 Cure Leukaemia run many fundraising events centred around sports and exercise; the Great Birmingham Run, London 2 Paris & Velo Birmingham & Midlands bike rides, Race to the Stones, the Three Peaks Challenge and many, many more. However, these events can be beneficial for you as well as for the charity. Exercise, of a variety of formats, has been found in research to have a positive effect on mental health and wellbeing. It has been found that individuals who regularly exercise experience better moods than those who do not. Not only can regular exercise improve your mood and your mental health, but it can also act as a prevention. Evidence from research has found that regular physical activity can protect against the development of depression and prevent your mood from getting too low. Other research has also found that exercise is as beneficial for improving depression and anxiety as forms of therapy. When looking at exercise in this sense, this includes aerobic exercise such as running and cycling, but also anaerobic such as body building and flexibility training. The improvement in mood also does not only happen with regular exercise. It has been found that after just one period of exercise your mood can be improved, and anxiety reduced, for a few hours up to even an entire day. Although it has been found that exercise in general, and of several types, can improve your mood and protect your mental wellbeing, there are some specific benefits for distinct types of exercise. Many of the big events planned by Cure Leukaemia centre around running and cycling, so we are going to look at the specific benefits of these two forms of exercise. Benefits of running that have been found include heightened daytime alertness, quicker onset of sleep, deeper sleep, and the reduction of symptoms of those with insomnia and sleep apnoea. Lack of sleep can have a detrimental effect on your mood and mental health, so ensuring you do have a good night’s sleep is very important. Running is closely linked with greater self-esteem. Studies have found that individuals who achieve faster running and improve their skills each time exhibit higher levels of self-esteem. Having higher self-esteem can keep your mood lifted as you feel better about yourself. Running has been found in studies to reduce anxiety symptoms and help you relax. Some studies have found that running may work as well as medication to relieve anxiety. There have been many studies that have concluded that running, jogging or brisk walking reduces the symptoms of clinical depression. Research has found that running is as effective as an intervention for depression as psychotherapy and cognitive behavioural therapy (CBT), which are very well known and respected treatments for depression. Cycling has been recognised to reduce tension, which is recognised by many cyclists. It has also been found that exercise such as cycling reduces your levels of cortisol, which is known as ‘the stress hormone’. It is important to find a way to reduce your stress levels otherwise too much stress can build up and have a significant impact on your mental health. Cycling stimulates the release of endorphins, which are known as ‘the feel-good hormones’, which can lead you to a feeling of mild euphoria. This feeling reduces anxiety and generally makes you feel happier. Taking a ride on a bike promotes mindfulness, which is where you focus on the sensations of the present moment, relieving your mind of any racing thoughts you may have. Cycling invites you to stay focussed on balancing, pushing the pedals and concentrating on where you are going. This offers your mind a break and helps to stop any thoughts becoming too overwhelming. The sheer joy you experience going fast and experiencing the elements has been described by cyclists as helping to relieve them of any undesired or pent-up feelings. Cycling has also been found to give people a sense of identity and belonging. It does this through connecting you to others through cycling and by you assuming and maintaining the identity of a cyclist. This gives you connections to interact with by meeting new friends and gaining mutual support, and a purpose through a new identity, which in turn will ensure a more positive mood. So why don’t you think about completing one of the events organised by Cure Leukaemia and do two wonderful things at the same time; raising money for an amazing charity and ensuring that you are improving your mood and mental wellbeing. Fox, K. (1999). The influence of physical activity on mental well-being. Public Health Nutrition, 2(3a), pp. 411-418. Mikkelsena, K., Stojanovskaa, L., Polenakovicb, M., Bosevskic, M., Apostolopoulosa, V. (2017). Exercise and mental health. Maturitas, 106, pp. 48–56. Peluso, M. A. M., and de Andrade, L. H. S. G. (2005). Physical activity and mental health: The association between exercise and mood. Clinics, 60(1), pp. 61-70.